Today the 6-acre Barn Inn Bed and Breakfast estate is situated on what, at one time, was a 90-acre farm owned by Fred Gehrig and his wife, Mary Bigler Gehrig, who operated the Honey Run Dairy Company, selling Swiss cheese and other dairy products from the home's cellar door. To this day, vats in which cheese was cured remain in the basement of the farmhouse, where the Innkeepers reside. The original spring that cooled the milk still serves the house with water. Cheesemaker and farmer, Fred Gehrig, operated Honey Run Dairy Co. on this farm until the mid 1920's. Born in 1874 in Switzerland, immigrated at age nine. Served on the school board and was a township trustee. Much of the Barn's history was learned from a 101-year-old Amish man, Johnny “Y” Schlabach, who lived nearby. 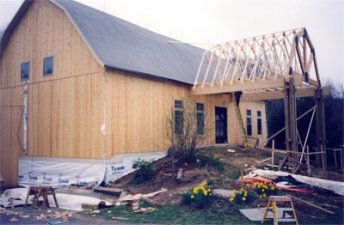 In a 1997 interview, Johnny said, “That’s the third barn on the foundation." Johnny lived just over the hills southeast of the barn. Recalling the early morning hours of August 5, 1919, when a severe storm invaded the night, “Perhaps 3 a.m. or 4 a.m., from my bedroom window, I saw a bolt of lightning strike and a glow in the sky, and I knew Fred’s barn was burning.” No animals were lost; however, all the crops and implements were consumed by the flames. That morning, Fred was grieving over his loss, and the Amish neighbor, Eli C. Stutzman, came and said, “Fred, we’re going to build you a barn.” The community of family, friends, and neighbors, Amish and otherwise, came together to contribute their time and resources to rebuild the Gehrig barn. Many weeks of preparation took place before the actual barn raising could occur. Charles O. Lahm, a young man from Baltic, Ohio, and owner of Lahm Brothers Construction, headed up the construction. Johnny "Y" told us, and a newspaper article from August 7, 1919 confirmed, that the barn was partially insured, which provided most of the funds for rebuilding. He recounted that a sawmill owned by the McCauslin Brothers was set up on the farm. A saw mill, powered by a gasoline engine, was set up and operated by John McCauslin, who was the head sawyer and his brother, William, assisted him. Trees at the top of the ridge were cut with two-man saws, dragged by teams of horses, and rolled down to the mill. Johnny recalled that a potentially dangerous incident occurred when Fred's son, Clarence, had his leg tangled in the rope of a rolling log. Thankfully, he managed to free himself without injury. The photo shown here is of the barn raising of the present barn. Fred Gehrig, remembered as a hard-working, honest man, was born in Switzerland. He spoke both English and Pennsylvania Dutch with a Swiss accent, thus he was able to communicate well with the Amish of the area. Due to Fred's interest in photography, we have a photo record of the farm. 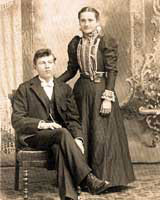 His wife, Mary, was a hard-working lady who milked cows and husked corn. Her niece said, "She did everything a man did." Over time, many different families made this farm their home. One outstanding Amish family who lived here was the David Stutzman family. It was David Stutzman's brother, Eli, who was the neighbor referred to above. From 1992 to 1996, the barn was part of a plant nursery. In 1996, Paul and Loretta Coblentz purchased the property, and began an eight-month renovation to transform it into the magnificent inn it is today. The renovation began with the services of an architect and engineer, and the hiring of a local Amish contractor. When they cleaned the beams, they used oil soap, paring knives for scraping spots, razor blades for cutting away masking tape that was adhered to or plastered between the drywall and the beams, and toothbrushes for cleaning the edges. They utilized lifts, ladders, and scaffolds to reach the beams that soar to 34 feet. In 2003, the couple added four grand, upscale West-Wing suites. In 2010, they embarked on another project and lovingly renovated the farmhouse for additional guest accommodations. We consider it a privilege to serve guests, whether local, or from around the world. In August of 2017, The Barn Inn came under the ownership of Gene and Michelle Rowland, a couple from Kentucky with over a decade of hospitality experience in the form of campgrounds. The Barn Inn Bed and Breakfast provides comfortable lodging and Amish-style cuisine to guests seeking exceptional accommodations during their vacation or weekend getaway. Our accommodations are centrally located between Columbus and Cleveland, Ohio, making it a great location to explore unspoiled Amish Country near Berlin in Holmes County, Ohio.